Home » Russian Culture » Russian Events » How Russian people celebrate Epiphany? Russia is very interesting in many areas. First, you might already familiar with its cultural heritage. In cities such as Moscow and St. Petersburg, you can find cultural wonders such as The Red Square and Winter Palace. Many of the places are UNESCO World Heritage sites, from palaces, churches, and old towns. Second, Russia is also blessed with an amazing landscape. Nature spans from Western Russian to far east at Siberia. I would need more than a lifetime to explore all! Just check out Lake Baikal alone. Around the biggest lake in the world, there are villages, forests, and many more to see. Food and culinary is another aspect of Russia you should taste. Plenty of local delicacies to taste, try some of them at these famous restaurants. You might also already familiar with Vodka, number one Russian Alcohol Beverages. Other traditional drinks are worth to try too, check out some of them in this article. Now, let’s take a look at the customs and traditions of Russia. Russia is also intriguing if you look at its culture. So many things are different from the rest of the worlds and Russian is very proud of their tradition. One of these traditions is The celebration of Epiphany Day. It is a Christian holiday, but it’s not Russia if they don’t have their own interesting way to celebrate it. There are several events behind the epiphany. It is the day when Jesus was baptized by John The Baptist. The holiday marks the revelation of the Holy Trinity, where God manifested in form of the holy trinity. The second event is the Adoration of Magi. According to the biblical story, it’s when three kings came into Jesus who was just born, bearing gifts. The last event is the wedding at Cana, the even in which Jesus turned water into wine. The event marks the first miracle of Jesus. When do Russian celebrate epiphany? Majority of the world celebrates the day of epiphany on January 6th, but Russians do not. The Russians celebrate Epiphany on January 19th. Why? It is because Russian use Julian Calendar, while the rest of the world refer on Georgian Calendar. Georgian Calendar is what widely used today while in the old time people use Julian Calendar. There are 13 days difference between Julian Calendar and Georgian Calendar. Russian people are actually not the only one celebrating Epiphany on January 19th. Almost every Slavic country also celebrate Epiphany on that date. People in these countries, the majority of them follow the Eastern Orthodox Church. The eastern orthodox is the largest Christian church institution in the world. What distinguishes Epiphany in Russia and the rest of the world? Apart from the date, Russian people are different when it comes to the ritual and celebration. The most unique ritual is cutting holes on frozen lakes or rivers. Then Russian people perform a dipping ritual on said holes. This holes-cutting and water-dipping are especially popular in Russia. Several other eastern European neighbors (or ex-soviet countries) have a similar tradition too. There are also variations. The rest of the world celebrate Epiphany in various ways, but none like Russian People. The most common celebrations is a parade. Others celebrate with children charities and events. Some countries celebrate it by having Halloween like trick-or-treats. It can be said, Russian way of dipping a below freezing point water is the most extreme of all celebration. How Russian people celebrate epiphany in the past? In the past, the tsar of Russia would hold a procession starting from the palace or the Kremlin. Then the party moved to the Moscow river. The Tsar would order a shrine to be erected on the ice and then the priest would hold another procession, the blessing of the water. The Tsar then dip his cross to the lake and would receive a blessing from the water. The water also was sprinkled to his family, army, banner, anything present at the time of the ritual. The water then brought back to the palace. The purpose is to bless the palace with said water. This ritual is recorded as early as the 14th century. All over Russia, churches held the similar but on a much more smaller scale celebration. One distinction, there wasn’t any frozen water dipping in the past. This part of the celebration is only popularized after the fall of the Soviet Union. The ritual was mainly a blessing procession for the water without any bathing. How Russian people celebrate epiphany today? In Modern day Russia, the celebration of Epiphany start from Midnight. People dug holes on frozen lakes and rivers. Sometimes, the holes are shaped in a cross. The priests lead the blessing and procession. 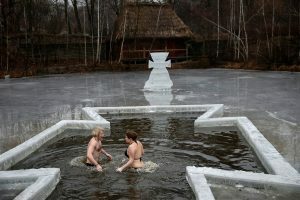 Russians believe that taking a plunge in this icy water is healthy and cleanse one’s spirit and soul. The ritual is believed to wash away sins from the previous year. The temperature can drop as low as minus 30 degree Celsius. But that doesn’t stop anybody to participate in the plunge. Any water source on epiphany day is blessed. People bring home water from Epiphany procession for various reason. Some drink it when they get ill, some drink it during the bad times. The blessed water only comes once a year, so Russian people store them for use later throughout the year. Plunging into the water is not always for a religious reason. The Epiphany day is also a Russian folk holiday, everyone can participate regardless of their religious affiliation. Many dip into the water for health reasons, others to test their strength. Nowadays, it’s also something people would show off at their social media. Overall, it’s to have fun! Tourists also welcome to participate in the Epiphany Day. In Moscow, the government set up pools, artificial or not, in every corner of the city so everyone can go to the nearest Epiphany celebration. However, To participate, tourists have to make preparation and know their limit. If you have a certain health condition, you may just consider sprinkling the water to your body. No need to force yourself. Even just watching people plunge can be fun.